Perfect for paths, patios & paving. Precast concrete pavers offer excellent appearance and durability in many different applications. Our quality concrete pavers can be used for patios, pool surrounds, driveways and more, all designed and installed to withstand Pennsylvania weather. Is it time for a concrete paver transformation at your house? The experts at Bowman Masonry & Waterproofing can install patio pavers, driveway pavers, as well as use concrete pavers to restore your damaged walkway or pool surround. Beautiful. Step up from the bland appearance of poured concrete, asphalt or gravel. Concrete pavers are available in a wide variety of shapes & colors. Different installation patterns & paver combinations add to your design possibilities. Durable. Thanks to a highly controlled manufacturing process, our pavers are dense, hard and highly resistant to wear and breakage. Versatile. Pavers look and perform equally well in driveways, walkways, patios & pool surrounds. Permeable. Pavers allow precipitation to penetrate into the soil between joints, helping to reduce erosion and flooding caused by high runoff. Easily repaired. Damaged pavers are easily replaced with no disruption or demolition of surrounding areas. Whether you want a short pathway or a massive backyard patio, we’d welcome the opportunity to survey your site, show off our paver selection and go over different design possibilities. The site visit and design consultation are free, so why not schedule a visit today! Contact us at 1-844-385-9894 or email us to setup an appointment for any of our concrete repair services in Pennsylvania. 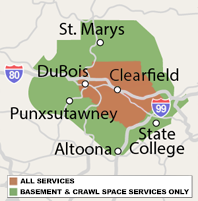 We service Saint Marys, Bellefonte, Altoona, State College, Du Bois, Tyrone, Port Matilda, Kersey, Brockway, Ridgway, Pennsylvania Furnace and the surrounding Greater Clearfield area.